Pakistan's largest city has come to a near standstill following the killing in London of an exiled leader of the powerful Muttahida Qaumi Movement. MQM supporters have gathered in Karachi to mourn Imran Farooq, who was stabbed outside his home on Thursday afternoon. A BBC correspondent in the city says the situation is tense, with most shops, restaurants and schools closed. The murder investigation has meanwhile been taken over by the Metropolitan Police's counter-terrorism unit, SO15. The BBC's home affairs correspondent, Danny Shaw, says although no-one has yet been arrested over the stabbing of Mr Farooq, the working assumption at this stage is that it was politically motivated. Karachi is Pakistan's business capital, largest city and only operational commercial port. It provides more than 50% of the tax revenue generated in the country and is literally Pakistan's lifeline. A great deal of the economic problems stem from the fighting that took place here between the MQM and the government in the 1990s. Although peace has since returned to the metropolis, sporadic violence has often put big pressure on the economy and the government of the day. Although it remains part of the central government, the MQM has always had a separate policy for Karachi and reacts violently to any attack on its members. In the past, this has led to a shutdown of all activities in Karachi, which is something Pakistan just cannot afford at the moment. The metropolis is the driving force of Pakistan's economy, and its trade and industry is even more important, given that floods have wrecked the rest of the country. There have been tensions between various political groups based in London and it is thought that Mr Farooq had been the subject of threats before, our correspondent says. The MQM's headquarters in the capital moved several months ago as a result of security concerns. Security around other Pakistani political figures is now being reviewed. Many in Pakistan fear that if the British police find a political link to Mr Farooq's death, serious rioting could follow. 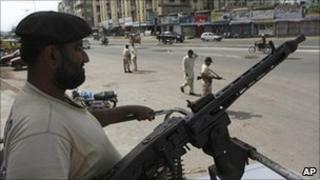 Last month, more than 80 people were killed in clashes in the city after the assassination of another MQM politician. The MQM has been accused by its critics of illegal activities, and of endorsing or ignoring ethnic, sectarian and political violence. Mr Farooq had been living in exile in the UK since 1999, when he claimed asylum. He had previously spent seven years on the run from Pakistani police, who accused him of involvement in several serious crimes. In 1999, he told the BBC the charges against him were politically motivated. The former Pakistani parliamentarian was one of the founding members of the MQM, a former opposition party which is now part of the ruling Pakistan People's Party-led alliance. After news emerged that he had been stabbed several times in the head and neck, the MQM declared a 10-day mourning period in Pakistan and in its offices across the world. Prime Minister Yousuf Raza Gilani said the PPP would also suspend its activities, adding: "It was a great loss to the party and the family." MQM leaders said they expected Mr Farooq's body to be flown back to Karachi for burial after legal formalities had been completed. Local media in Karachi reported that some vehicles were torched and shots fired late on Thursday, but police said there had been no violence on Friday as hundreds of party activists converged on his family home. Amid fears that the crowd could turn violent, most markets, restaurants and schools were closed and no public transport was available. Police and paramilitary troops were deployed on the city's main streets to maintain order, officials said. The BBC's Shoaib Hasan in Karachi says MQM leaders had told him there was "a lot of grief and a lot of sorrow going around". But, our correspondent says, the situation has remained relatively peaceful. Mr Farooq was in essence the party's deputy leader, though he had not returned to Pakistan since claiming asylum in the UK, he adds. He had become marginalised recently, but was still powerful in Karachi. Raza Haroon, a member of the MQM central co-ordination committee in London, told reporters: "He was a gentleman, a very, very soft spoken person with a lot of knowledge, and who was very outspoken as well. Media captionFriend Mohammad Anwar: "We are in a state of profound shock"
"It's a very huge loss to the party to have lost a senior leader, in such a manner. This is an irreparable loss and a great tragedy for the MQM. "Nobody could really have thought that this act of violence could happen in London, but at this moment we do not know what happened." Dozens of people were killed and hundreds were wounded in several days of clashes in Karachi last month, sparked by the killing of an MQM parliamentarian, Raza Haidar. He was shot dead while attending a funeral. Most of those killed belonged to the Pashtun community, whom MQM leaders had initially held responsible for the attack. Investigators later said the pro-Taliban militant group, Lashkar-e-Jhangvi, was behind it. The MQM came to prominence as an advocate for the rights of Pakistan's "Mohajir" community - Urdu speakers who originally travelled to the country from India following partition in 1947. The party seized power in Karachi - home to Pakistan's largest Urdu-speaking population - in the 1980s. It was accused of involvement in torture, summary killings and other abuses. In 1992, the authorities launched Operation Clean Up, and over the next six years some 8,000 people were killed and Mr Farooq fled to London. The MQM's leader, Altaf Hussein, has lived in the capital since 1992, and runs it from an anonymous office in the suburb of Barnet.